Chatting Over Chocolate: Trip Report Tuesday - WDW Day 2 // Little One's Birthday! 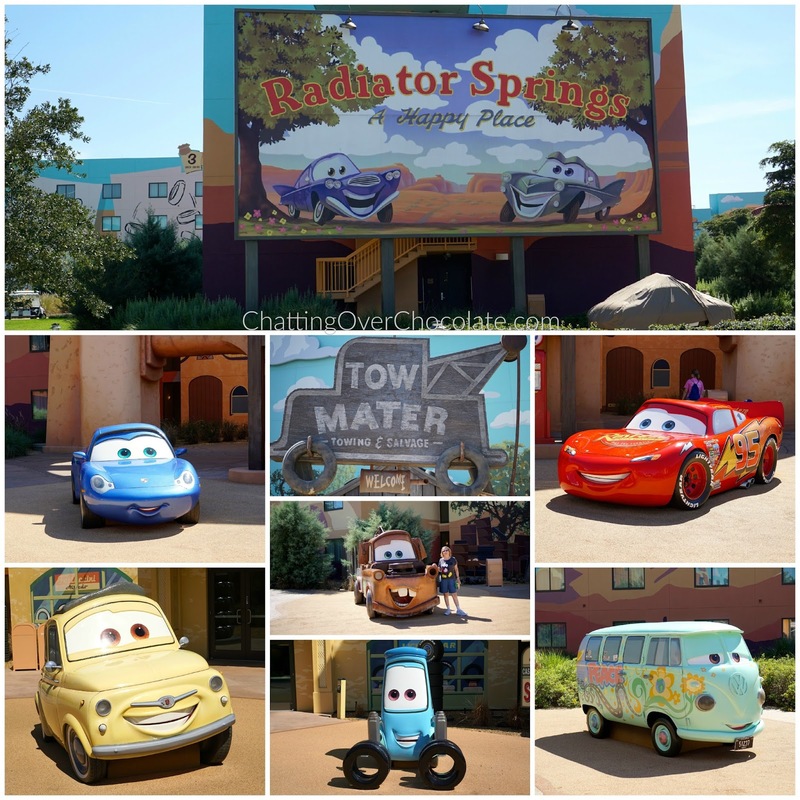 Trip Report Tuesday - WDW Day 2 // Little One's Birthday! It's time to share one of my favorite days of our most recent Disney trip, Little One's Birthday! 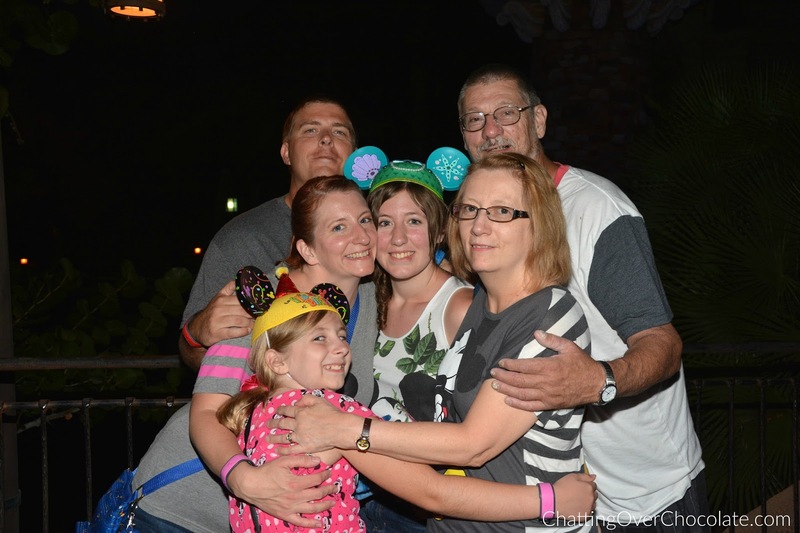 We have celebrated many things at Walt Disney World over the years. 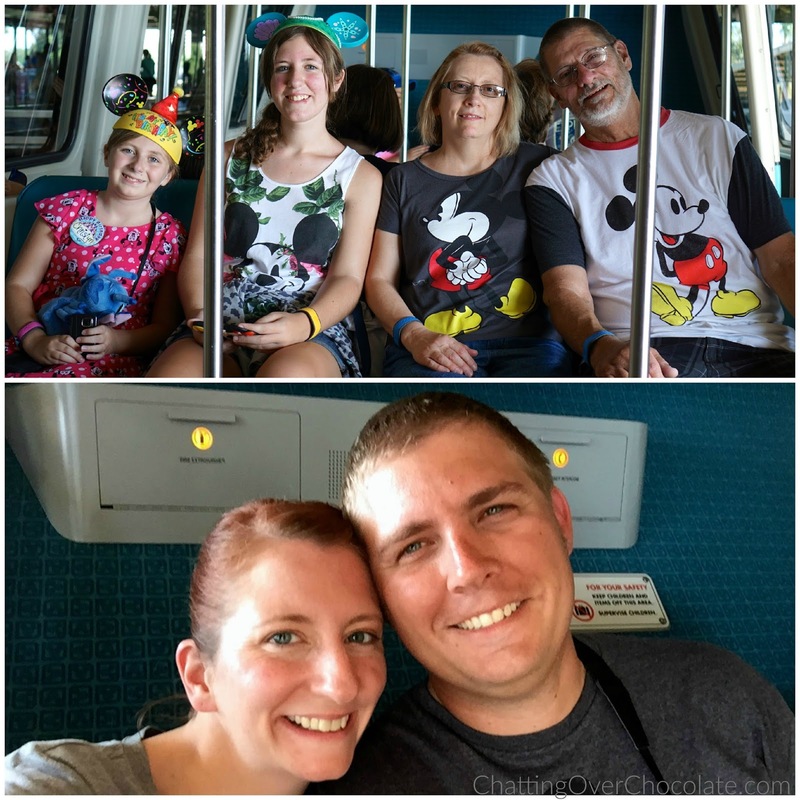 Jason and I enjoyed a Disney honeymoon and a few anniversary celebrations there, but this was the first time we had the joy of being there on one of our birthdays. It was every bit as special as we dreamed it would be! Ready to hear all about it? Ok, let's get to the good stuff! 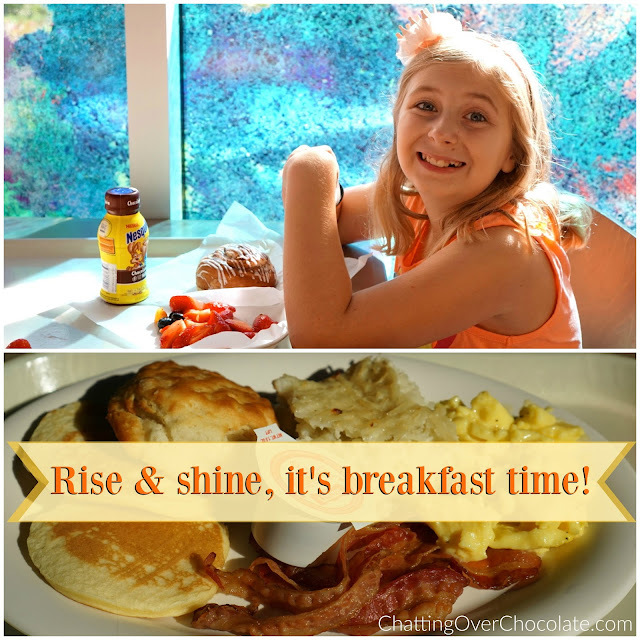 Our day began with a family breakfast at Art of Animation's Landscape of Flavors. Much like Little One's choice of breakfast, the day got off to a "sweet" start! Throwing caution to the wind (we were on vacation after all) Jason ignored the "wait a half an hour after eating" rule and took Little One to the Cozy Cone Pool for some fun in the sun! Meanwhile, the rest of us were in the suite preparing for a birthday party! Approximately two dozen canon balls later they returned to the room, showered, and were ready to celebrate. We gathered chairs around the living room area and watched Little One's joy, surprise, and excitement grow with each new gift she pulled from her gift bag! It was such a fun lit'l birthday bash! 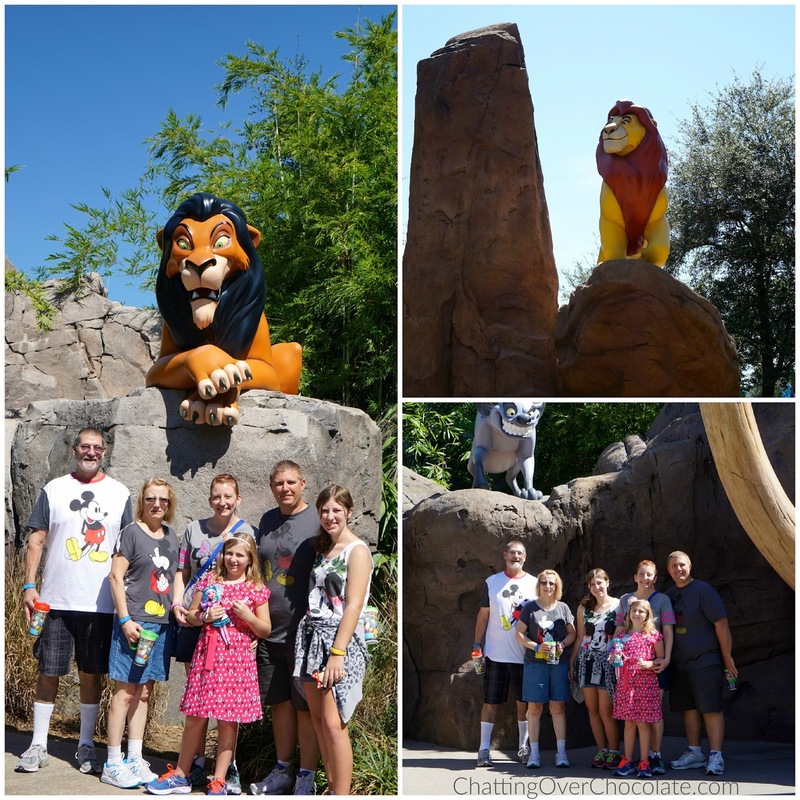 Since this would be our last day at Art of Animation before moving on for our week at Disney's Animal Kingdom Lodge, we took this opportunity to show my parents around a bit! A kind gal from housekeeping mousekeeping saw us taking photos and offered to take about a half a dozen pics of us in various spots throughout The Lion King section of the resort! The Little Mermaid section of the resort is still one of our favorite spots here. To see more of this area check out this post from our previous WDW vacation! These car-acters were just outside our Cars Family Suite. 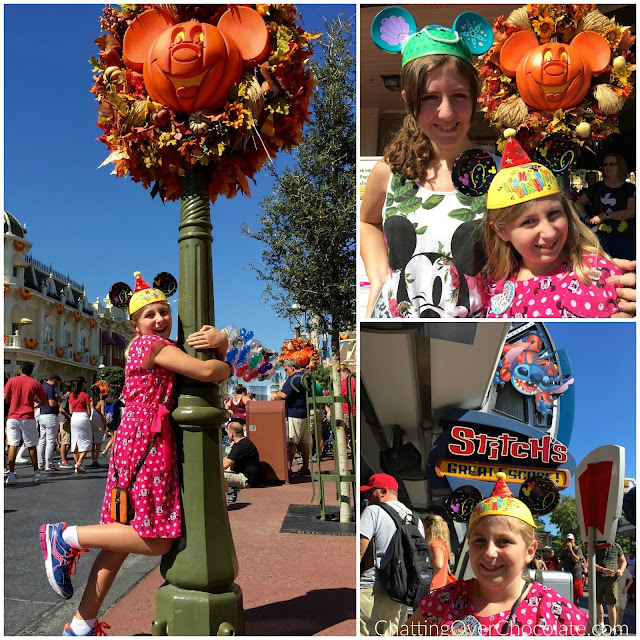 First things first, the girls needed some new Mickey ears! A quick trip to the Newsstand, and they were both decked out and ready for Little One's "dream birthday"! 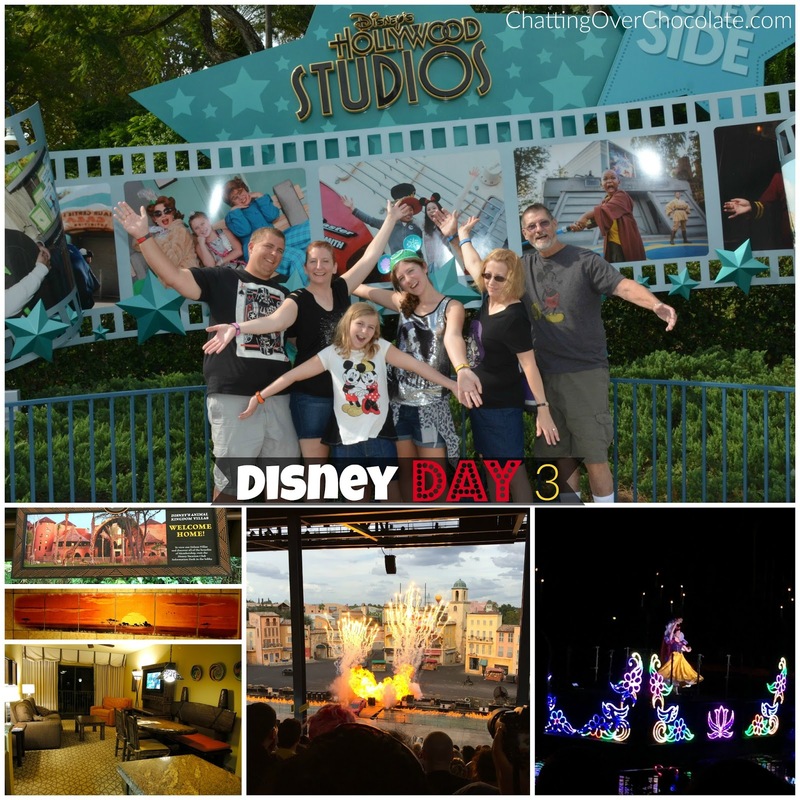 Yep, we let her plan out the entire day, complete with her favorite attractions. After taking in the fabulous fall decor along Main Street, we made a beeline over to Tomorrowland where we'd find one of her favorite characters, Stitch, creating mischief as usual! 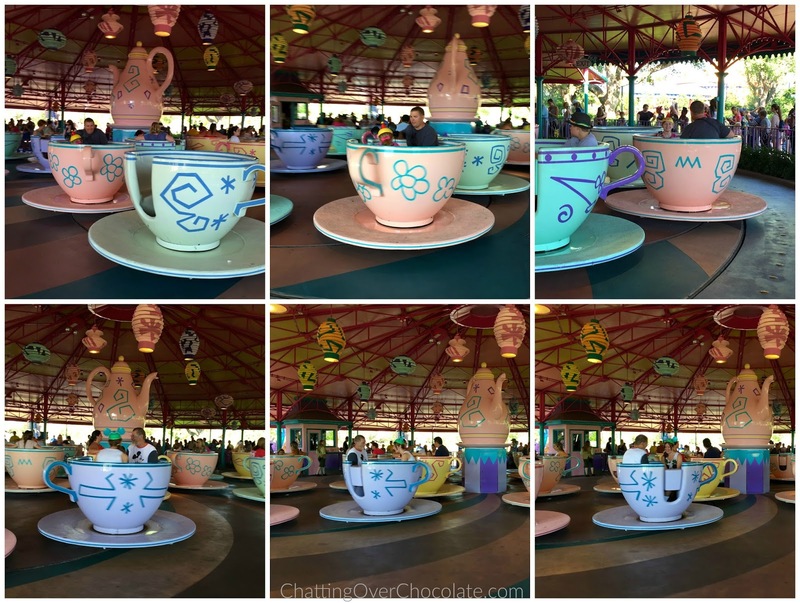 Mad Tea Party was next on her list! The Birthday Girl and her daddy spun in the pink cup while Princess and her grandpa took the blue saucer for a whirl! My mom and I aren't much for roundy-round rides, but we snapped photos and enjoyed watching their grins as they twirled themselves silly! 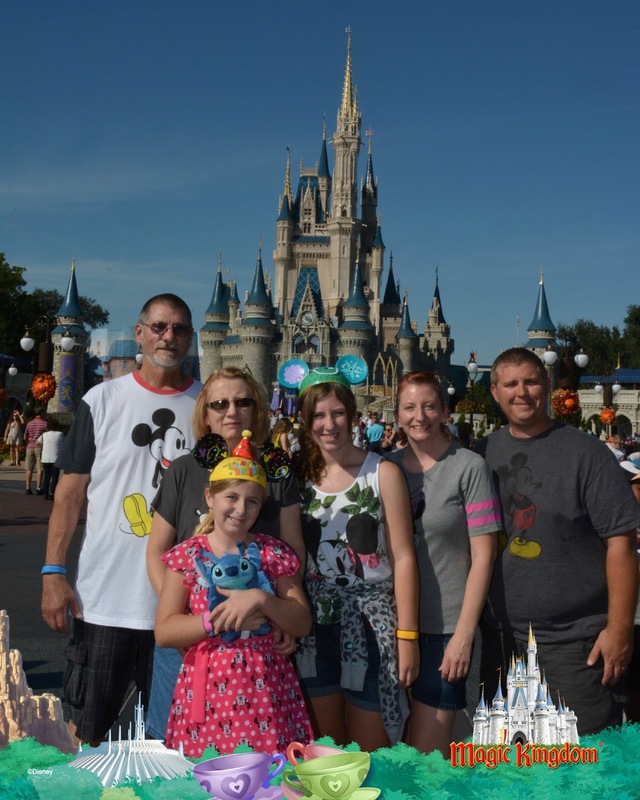 Our first PhotoPass pic of the trip, complete with the Stitch plush Little One bought with birthday money from her grandparents! After a couple rides and PhotoPass ops we hopped on the monorail for a quick trip to Disney's Contemporary Resort. Shopping, celebratory deliciousness, and character fun, here we come! Months ago when we asked Little One where she'd like us to make reservations for her birthday dinner, she didn't have to give it a moment's thought. She immediately chose Chef Mickey's, a longtime family favorite! We enjoyed a wide variety of deliciousness from the buffet in between visits from our old pals! 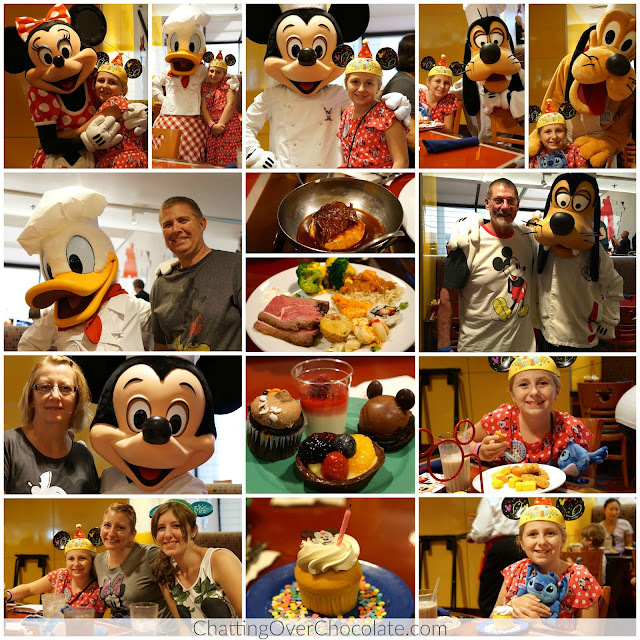 Our character meal at Chef Mickey's was definitely one of the highlights of this wonderful day! 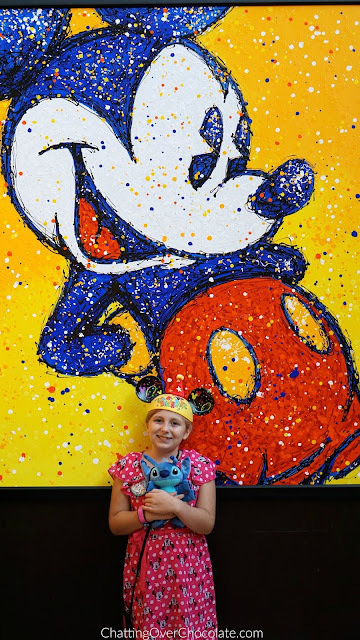 Any meal that starts with hugging Mickey Mouse and ends with sprinkles and a lit candle cannot be beat! 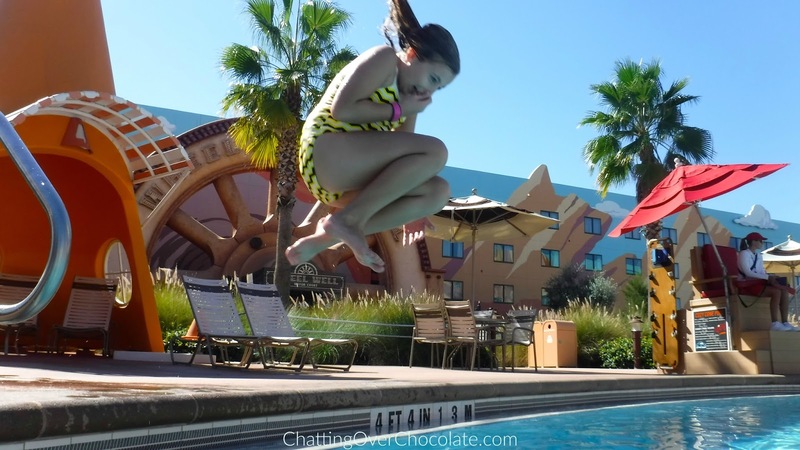 There's so much to love about the Contemporary! I adore the artwork, and the cutie pie posing in front of this particular piece! With full bellies and happy hearts, we took a leisurely stroll from the Contemporary back to Magic Kingdom for a grand finale to an already fantastic day! The first ride of the evening was Under the Sea - Journey of the Little Mermaid! 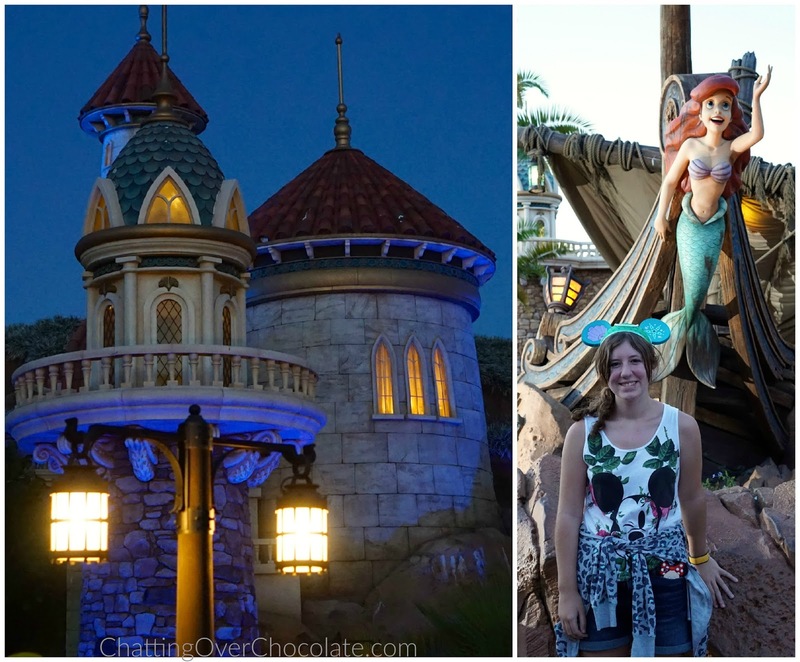 Princess was perfectly styled for it with her new Ariel inspired mouse ears. The time had finally come for something that we'd been greatly anticipating for over a year, a ride on the Seven Dwarfs Mine Train! This ride opened shortly after our last Disney vacation. We'd done all we could to avoid "spoilers" and could hardly wait to experience Magic Kingdom's newest attraction! It did not disappoint! We LOVED it! Watch this video closely. You may recognize some of the train's passengers! 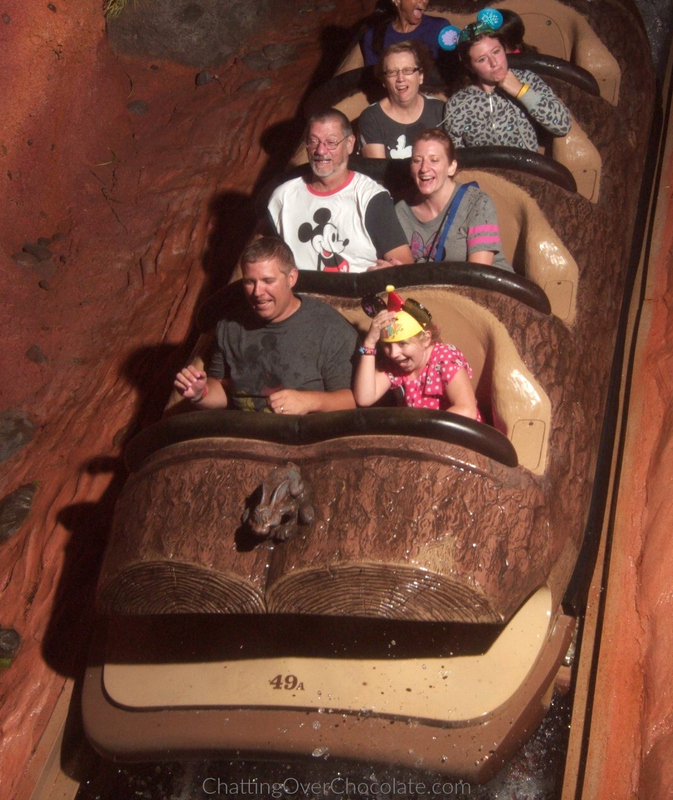 Saving the best for last, we boarded Little One's all-time favorite, Splash Mountain! The birthday girl's face says it all! Group hug at the end of a great day! It was such a treat to end this extra special day with a bang, and a whole lot of sparkle! "Make a wish, and do as dreamers do..."
Princess, my dad, and I made a mad dash to the food court to fill up our Rapid Refill mugs before they closed at midnight. 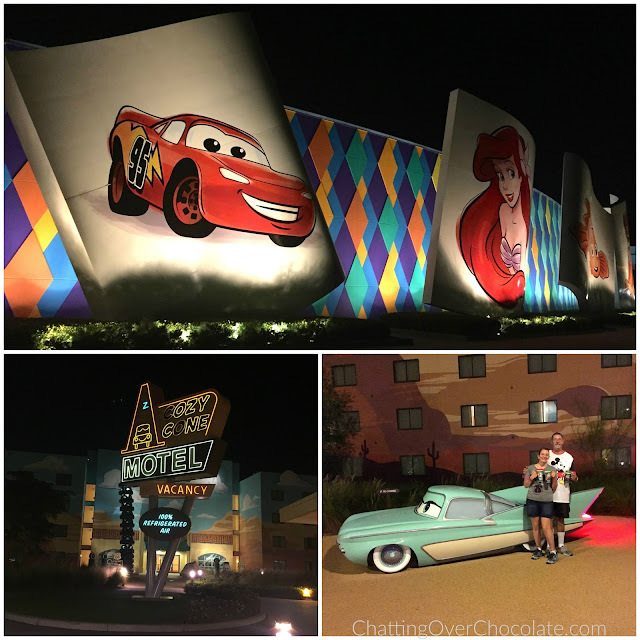 While we were out, it was fun to see these taillights all lit up and the signs aglow! 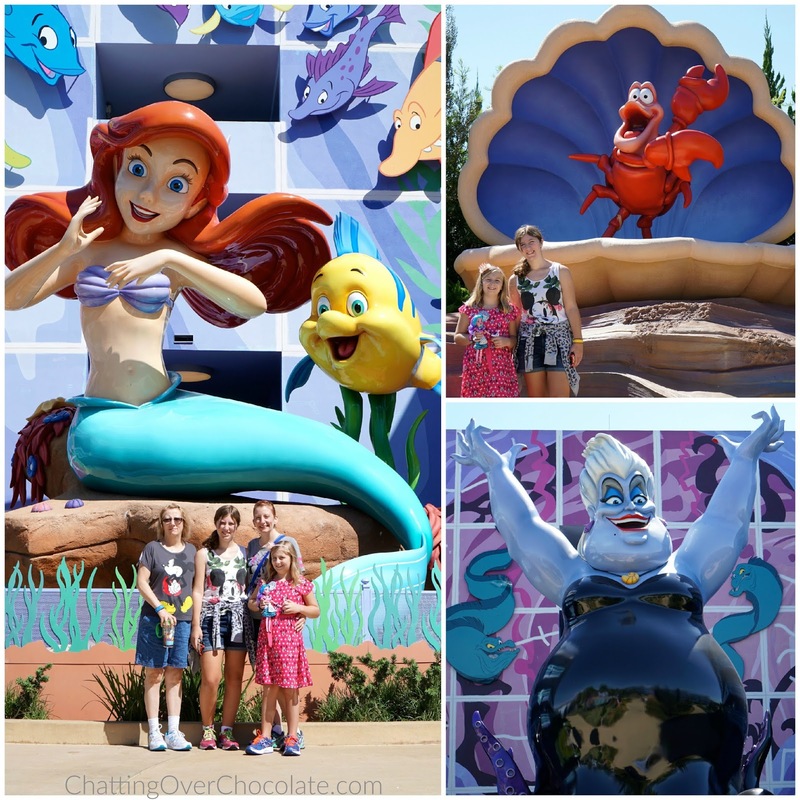 The next day we'd be moving to our Disney Vacation Club "home", but we sure had enjoyed our weekend at Art of Animation! Watch this day's correlating videos on my family's YouTube channel, Eat, Sleep, Dis, Repeat! You'll find Day 1 Part 1 here and Day 1 Part 2 here! My husband Jason publishes a new video weekly, so be sure to click that "subscribe" button while there to catch future videos! Hope you'll be back to hear about Day 3, next Tuesday! Sounds like a fabulous day to me! 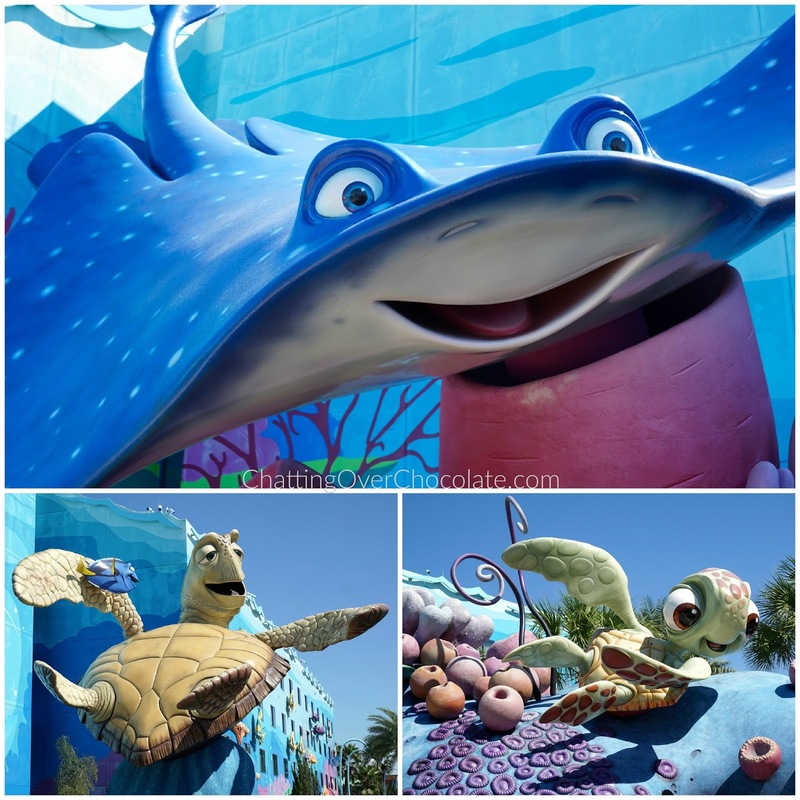 Art of Animation really looks like such a cool resort - we definitely have to check it out sometime! I love the shot of all of you in front of Cinderella's castle - it came out perfect! 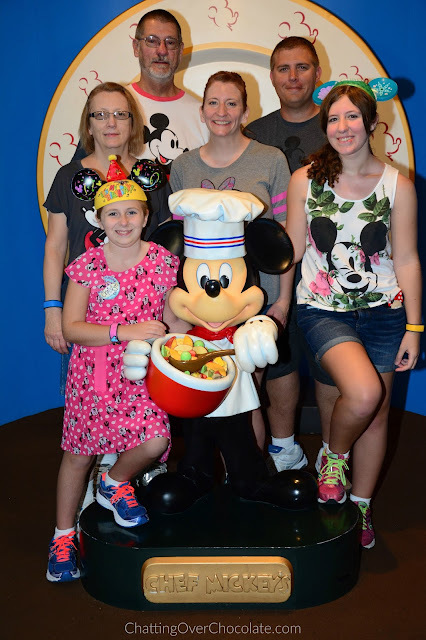 Chef Mickey's was a great birthday choice - looks like you guys had a wonderful time! We LOVED our meal there! Can't wait to read more! What a great birthday!! I'm so jealous! I would love to be at Disney for my birthday!! I love all the pictures! 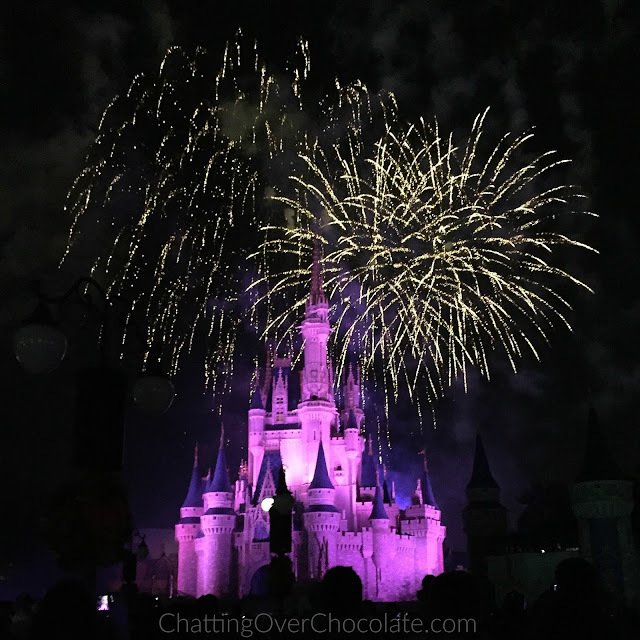 The picture of the fireworks over Cinderella's castle is absolutely amazing! What an AWESOME way to spend a birthday!! I love that the Mine Train gives you the video of your ride - so fun! I think your little one had a fantastic day! Sounds like a fabulous time was had by all :)! You've brought a little magic to my day, thank you so much :) What a perfect birthday!!! What a perfect way to celebrate a birthday! This is the first time Aria will be at Disney for her birthday this year too. I'm so excited to party it up Disney style. 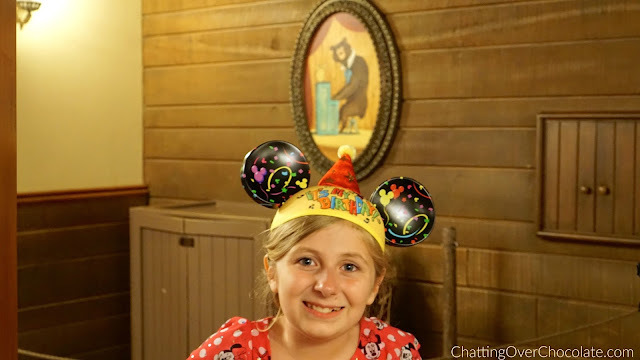 I wonder if she would wear ears =) I am impatiently waiting for Aria to get tall enough for the Mine Train. That one is 38 perhaps? She's around 37. It's fun having new rides open up as she gets taller. I think I already saw this youtube, I remember the suite party! WOWZA!! What a wonderful trip!!! The happiness and excitement is so apparent in this post!! Talk about the perfect birthday ever!!! 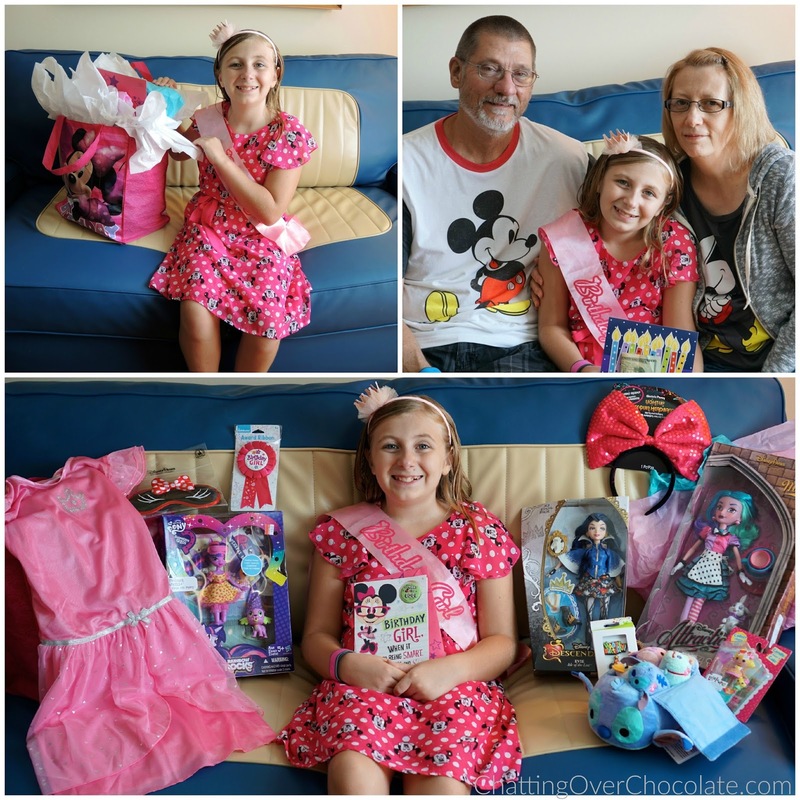 So glad she had a wonderful day - but how could you not at Disney?! :) If only every day could end with Wishes! 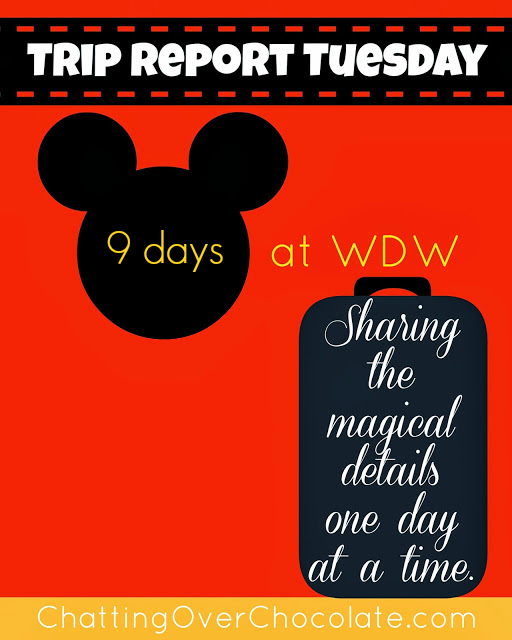 I just love your trip reports! 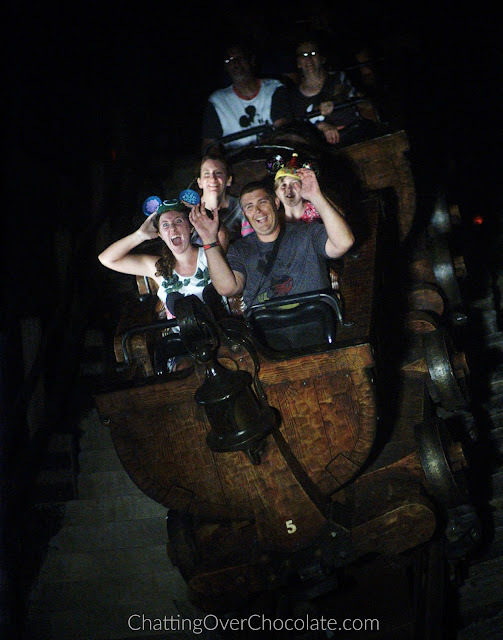 Is that video from the Mine Train a Photopass thing? So cool!